Despite feeling warm and safe in the car, I didn’t sleep well that first night. Maybe it was because I was overwhelmed and missed Curtis, maybe it was because Charlotte demanded on sharing my sleeping bag, who knows? 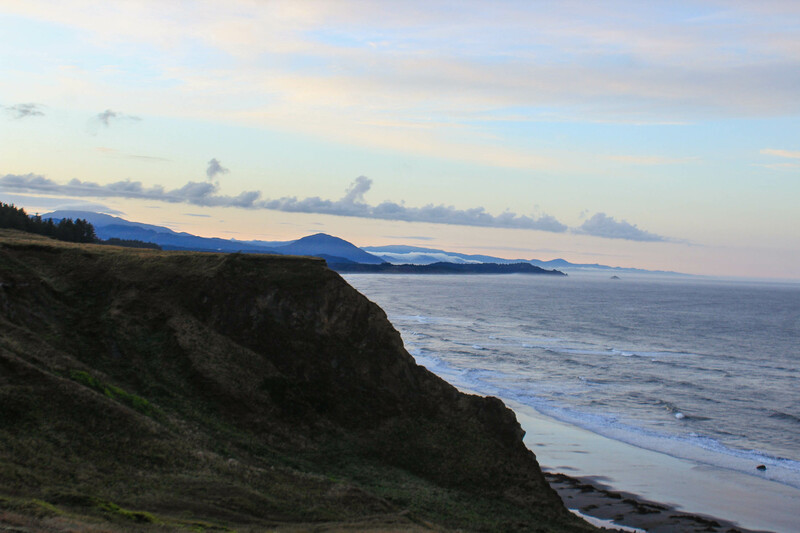 We got up early and drove back to Cape Blanco Lighthouse to see the sunrise. I was eager to call Curtis, but knew that he was 3 hours off with the time change, and while he could be jet lagged I didn’t underestimate his power to sleep in. Instead, I continued driving down the coast with plans to call him as early as I thought was appropriate. My original itinerary had me camping in more central Oregon and spending 2 days driving down the coast, but I decided that with the amount of stops I was making that it wasn’t necessary to take another full day on 101. There’s no doubt that the coast is absolutely stunning and the most beautiful views I’d ever seen of the ocean, but there comes a point where it’s too much of a good thing. White Point, Nova Scotia is a place that is almost always on my mind — it stood out from everything else I had seen on Cape Breton Island. The Oregon Coast had so much incredible scenery like that the entire way down, to the point where it all blends together and I don’t remember each individual location. I was ready for more variety. I did make a few more stops though — how could I not? Charlotte still needed to walk around so we got out and walked around a few times. I did consider hiking one peak that stood right next to the ocean — Humbug Mountain — but when I arrived, I was met by one other person, another solo female traveler who was leaving the trail. I asked her how far she went, and she told me it was very dense, muddy, and buggy and she hadn’t made it far. What really changed my mind was the sign at the trailhead, where people had added their own notices: “Mountain Lion Seen 9/6,” and other dates written underneath that, leading to just 3 days prior. Below that note was another, “Bee Hive on ground around 2 miles in,” with other hikers chiming in with “They got me!” Nope, I was definitely not doing this alone. 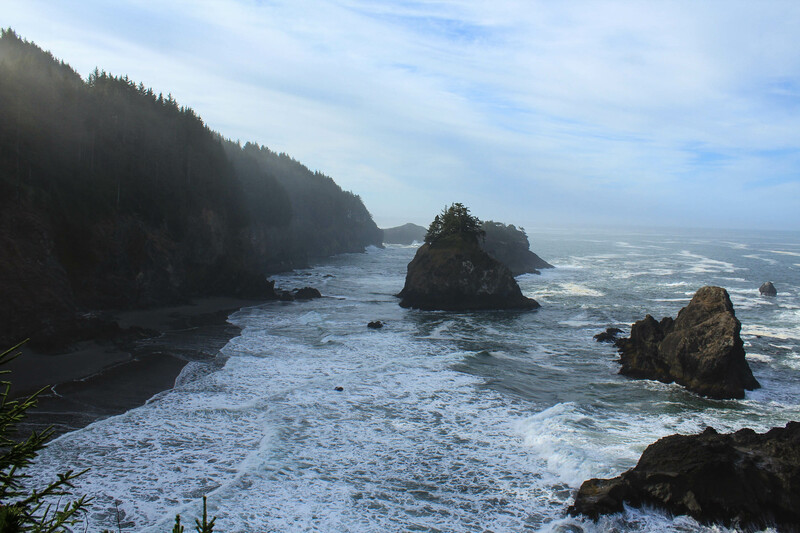 I did enjoy stopping and walking around at Samuel H Boardman State Scenic Corridor, Cape Sebastian State Scenic Corridor, and another quiet beach. Once I made it to Brookings, I called Curtis to check in. This lifted my spirits and I was glad to hear he made it safely and was figuring things out. I felt so conflicted between just wanting to be with him in Hawaii, but also wanting to enjoy where I was because Oregon is amazing, and I’d still have 3 years to live in Hawaii and enjoy all there is to do there. I tried to not make him too jealous of what I was doing, but that was already quite a challenge. At least I wasn’t letterboxing without him, and everywhere I was going was so beautiful that I would love to return with him someday. After hanging up, Charlotte and I continued heading South…to California! Charlie had never been, so I thought it would be fun to add another state to her list. Of course she cares about that. 😉 We left 101 for highway 197 to pay a visit to the Redwoods. 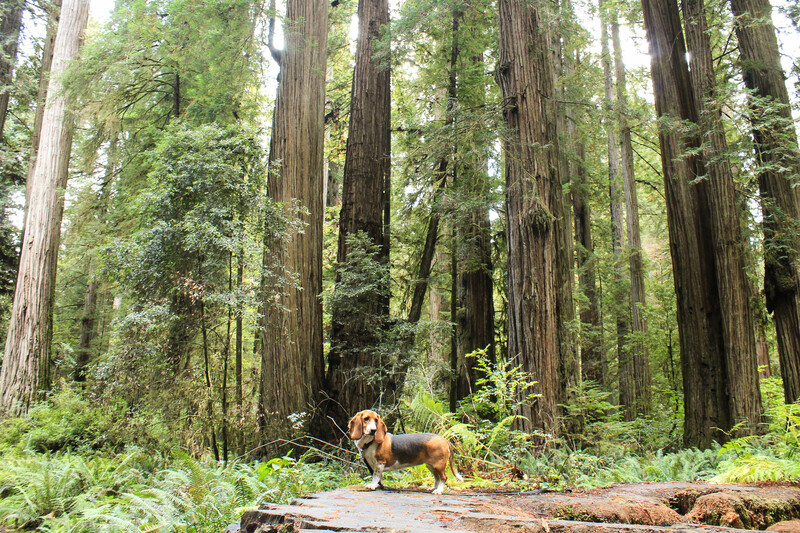 I couldn’t hike any trails with Charlotte, but I knew I didn’t have to hike a trail to enjoy those big majestic trees…and I was right. Shortly after leaving 101, the trees became giant and I was literally exclaiming out loud to Charlotte the total shock and awe that I was feeling. This was the variety I was looking for…and my mind was blown. I drove to the Northernmost visitor’s center and asked what I could do with my dog, and the helpful ranger pointed out a couple of dirt roads I could park on and walk down that would be just as good as hiking a trail. I happily made my way to Walker Road, parked immediately and took Charlotte on a walk. 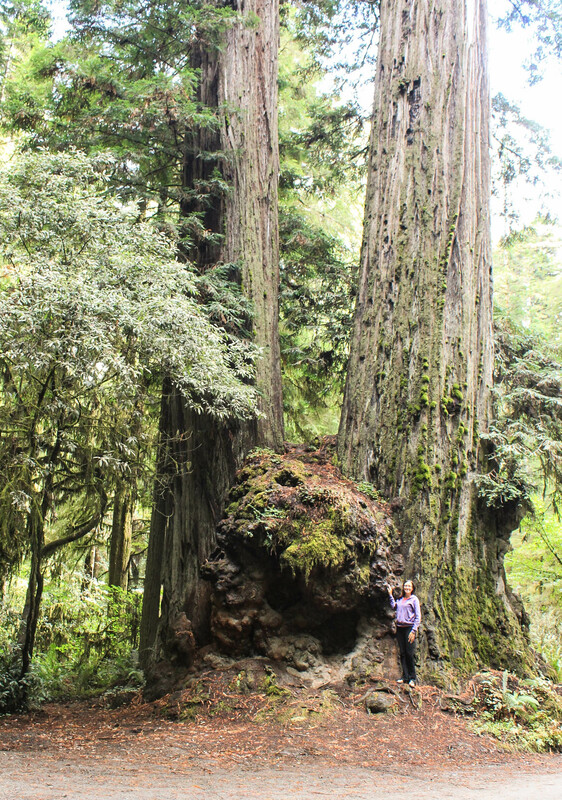 It is an incredible, humbling experience to be standing next to these trees, and I was both speechless and filled with awe and praise to their Creator. I found a giant stump and put Charlotte on top for a photoshoot, then tried pathetically to get pictures of myself to show the scale. I definitely want to come back here. Once finished with our walk, we drove back to the Crescent City, and to the coast one more time. 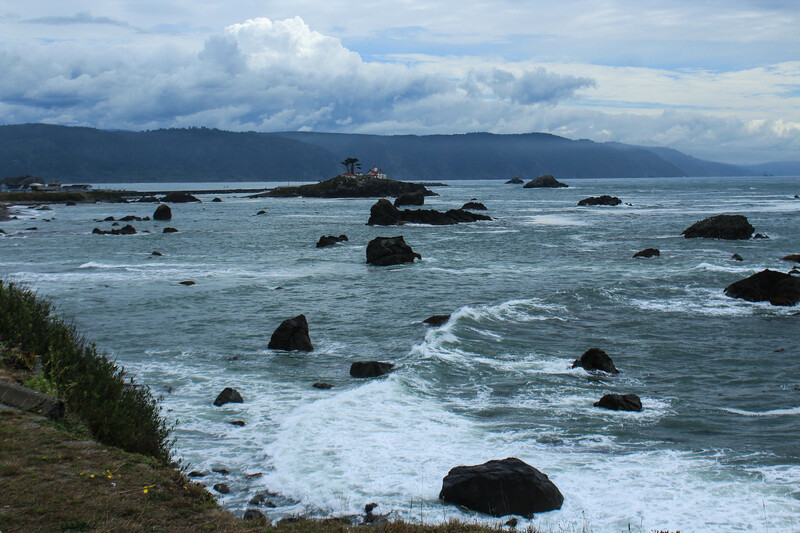 We saw the beautiful lighthouse out on the water and surrounded by rocks, then drove North to Point Saint George, which was the perfect place to end our time on the coast. We went for a long quiet walk, admiring the cliffs, the rocks, and how the waves splashed into the rocks. 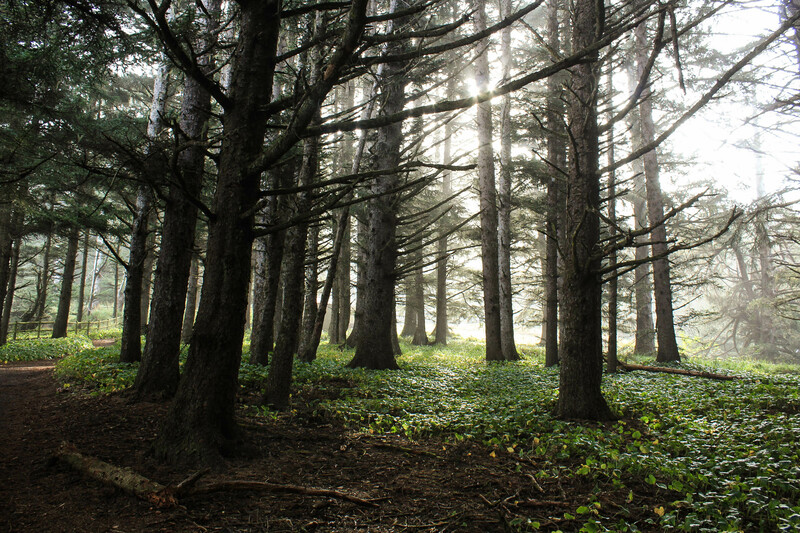 We ended up camping in a county park that night, away from the national park traffic but still among the Redwoods. There was still some daylight left and there were several trails that circled around, so I let Charlotte’s nose lead us around and around the trails before calling it a night. Over 100 miles driven, several breathtaking sights taken in, and feeling more and more enthused about all the possibilities that lay before me.